16 – 20 August, Edinburgh during the Edinburgh Festival Fringe. Hosted by the Canadian Association of Fringe Festivals (CAFF) & Montréal Fringe. The Congress took place at le Conseil des Arts de Montréal -and Théâtre MainLine Theatre – 3997 Boulevard Saint-Laurent. World Fringe Congress 2014 took place during the Edinburgh Festival Fringe – the world’s largest arts festival and birthplace of the original Fringe from 15-17 August 2014. Hosted by the Edinburgh Festival Fringe Society it was attended by 56 delegates representing 38 fringe festivals from 15 countries across 4 continents. World Fringe Congress 2014 was part of the Culture 2014 programme, which accompanied the Commonwealth Games which took place in Glasgow, and was funded by the City of Edinburgh Council, Creative Scotland, EventScotland and British Council Scotland. 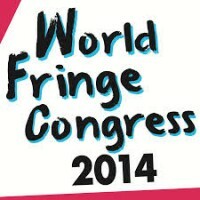 Hear what the 2014 delegates have to say about attending the World Fringe Congress. The inaugural World Fringe Congress took place in Edinburgh between 16 and 19 August 2012 and was attended by 74 delegates representing 47 fringe festivals from 16 countries across 6 continents. The 2012 World Fringe Congress was part of the London 2012 Festival, the cultural celebration around the Olympic Games, and was funded by the City of Edinburgh Council, Creative Scotland and British Council Scotland. The panel discussions and workshop sessions were recorded and are freely available as a resource for anyone working at or interested in Fringes.